The autobiography of a community muralist. The Blue Horse -IN search of blue horses….the story of the herd. Come walk with me in a field so green, and a sky so blue. Come be quiet, and still, and listen to the air, as it swirls my hair and yours. Feel the dandilion seeds tickle your freckles and the lady bugs paint your toes. I will hear your dreams and breathe in your fears. It will not matter that you did not comb your hair today, and that your feet are covered in dark rose coloured earth. We will feel the sun colour our skin and we will all be blue horses. In the field there are Indian paintbrushes. If you pick them they are sweet, taste the flowers on your tongue. Wild strawberries hide underneath the tall grass, and you can paint your lips with the rosy taste of them. Huckleberries grow here too. Big plump wild berries that burst in your mouth like fireworks of sweet and sour. The earth has many secret gifts for us to discover. Things that we can eat and things that we can smell and things that we can take pictures of with our camera eyes and revisit when the night is dark. I can see you walk with only two feet and me with four and I wonder how you don’t fall over when you run. We are different you and I, but also the same. My family are painted horses. Every pattern you can imagine leave stories and maps on each of my family members. Every colour combination you can imagine; black and white blended edges patches, spots, dapples, gold, white, grey and the darkest of chocolate brown. Running free around me, in front of me and in my past. I imagine my great grandmother to be a glorious dark sienna brown coloured horse, her eyes soft yet fierce as she journeyed to a new land. Her long mane tangled with seeds from her homeland, dropping them as she runs excitedly through the mountain roads and finds her place in the new land. I hear her still when I run in the wind. Her soft sound of wisdom echo in the day to day breezes. They swirl and dance in red boots with red yellow and blue ribbons in her mane. And like a wild child she dances, free and far away, the red fading as she reaches the edge of the meadow. Then she is gone. I wish for red boots too. But my boots are not red, they are dark in colour and sturdy. I wonder if they can dance like my mother dances. She is a small horse, dove grey in colour and soft in nature and fur. Wispy like the clouds on a summer day. She too has ribbons in her mane, turquois and velvety, they are are thick and soft as they move around her head telling a story of strength and resilience and moving the wisps of hair among the velvet in soft whispers. I run along the ribbons and feel the wisps and then feel my hooves thunder as I run past the herd, I stumble and stop and look back at the meadow and see so many horses in the ribbons and wisps. Like a mirror of reflections in colours and sizes too many to define. 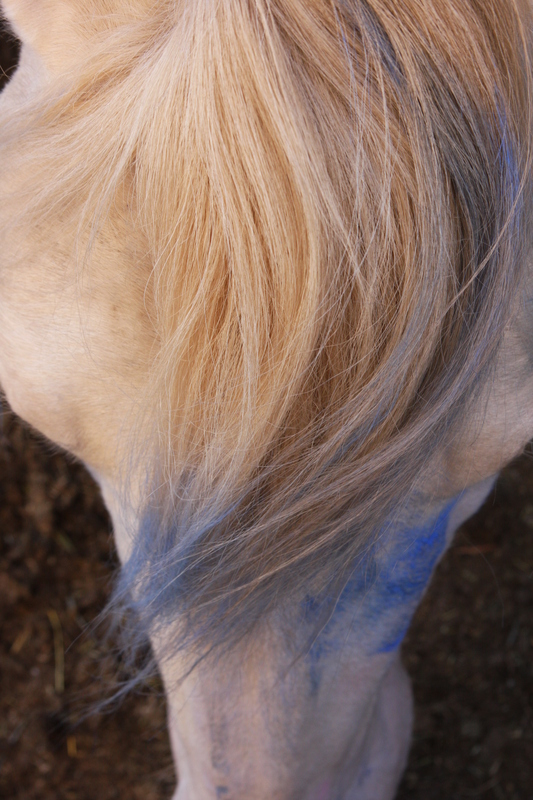 I am a blue horse, my colour darkens every day ever so slightly. The pale shade melting into blue grey, then to blue, then to indigo as time passes. I try not to wonder why there are no other blue horses. I wonder why I do not have ribbons. I yearn for ribbons,but I only feel my hair in the wind; it is its own wind,never falling as it seems it should when I race across the paths. Standing in funny angles when I pause to breathe in the air and thoughts of the herd. They are amused by my mane; I know this, as I am amused by it too. Like it wants to run in a place different than where I want to be. In another place and time. Reaching for the ribbons but never quite grasping them. The indigo strands believes they belong in a paint brush. With long fingers the hair reaches through history and tell the stories of the yearned for ribbons. With dancing strokes, the brush captures colours and light and lays the music at my feet. I paint ribbons for the ribbons I can not see. The ribbons that lay in the past, some around the herds feet, a trampled pallet path I can not see. We each have a place in the herd. A spot where all your feet land, or a spot that lets you walk, run and on somedays lean on the others. But your spot stays the same. A small stop in the rain, a sunlight beam in a window, a fresh apple, sweet and crisp as you bite. It is but for a time. As a young horse the time seemed slow, never anxiously passing, but waiting for the blue to unfold. Time was abundant and plump. The grass was plenty and fresh as I ran in the circles nibbling. Storms would thunder overhead, but the manes of the herd would muffle the sound, and I would play in the rain and watch the puddles form in long still paths. The rain was warm sliding down my face, the storms would flash but the ribbons would create swirls and mandela like forms above me. Flashes of dark light would cut through the ribbons and I was afraid. The sky would float past and time again would cover my eyes with quiet. I am much bluer now..a dark indigo. My eyes are indigo too. There is no mistaking me for being like the others. I am not the same. I am blue. I am blue. A horse walks in two worlds they say. The spirit world and the earth world. I am not of this earth, time saturated world. My feet are on the ground. But my eyes see from the sky. Confusing visions distort the distance I am to travel and the time feels rapid like bird wings, yet my feet are on the ground. Sturdy and still dark, mud touching my hooves in tell-tale journal entries. I see me looking at the mud and know my eyes see from the sky. I am but not alone, yet by myself. She has bright eyes and a sharp will, He has bright eyes and strong legs. They all have bright eyes. Shades of green, blue and gold touch them all. Their manes are strong and wild, reaching crazy in the wind with eager whips of touch. The dandelions blow across the fields and mountains as they run in vast explosions of mist. Thundering sounds and wild open bucking creating morphed visions of horse and sky. The air smells of green apple bites and warmth. Sunshine smells on the back of the neck of a boy on a hot day. My blue eyes and my body is still, and the ribbons of blue lay at my feet. Except possibly for the dog, no animal has contributed more to humanity than the horse. It has fed and sheltered us, and provided us with clothing and transportation; it has been both worshipped as a god and slaughtered to appease the gods.